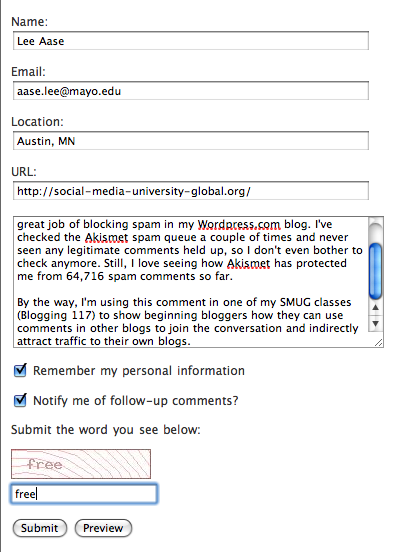 When you comment on a blog, you will want to include the URL for your blog in the “URL” field. Then, when your comment is published, your name becomes a clickable link, so that as people see what you’ve said and think it’s thoughtful, they may want to come and see what else you’ve written on your own blog. I personally don’t use comment moderation or a Captcha, because I don’t want to slow up the conversation and because Akismet does a great job of sniffing out the bad stuff. 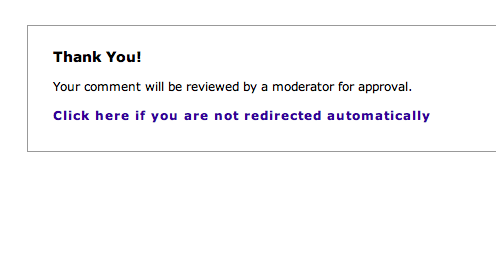 I have occasional problems, but I’d rather have my commenters get instant gratification for their efforts. I ruthlessly root out any spam after the fact. Because Scott doesn’t moderate comments in advance either, my comment showed up immediately, with my name as a link to SMUG. You also can sometimes paste a link to a specific post within your comment, but do this with care and make sure it’s relevant. Links within comments are sometimes viewed as suspicious, that perhaps the commenter is more interested in promoting his or her site than in contributing to the conversation. I first met Scott through a thoughtful comment he left here. Commenting in the right way, by becoming meaningfully involved in the discussion, is a way of doing well by doing good. You guessed it…leave a comment below. Include the URL to your blog. You will at least get one new visitor to your blog as I check it out. Maybe other SMUGgles will come for a visit as well. Whenever I see a headline that suggests anything to do with attracting visitors to my blog I naturally read … this was the first one that focused on commenting from a strategic content perspective. But as I consider this, I realize that my favorite blog is indeed one in which the commenters are fully engaged in a dialog (check it out at http://blogs.asaecenter.org/Acronym/) and that I often click through to rad more from them. Hi Peggy – your comment had been held in moderation because it had two URLs in it; WordPress.com defaults to hold those in moderation if they have more than one link, because that’s a common spammer technique, to just overload with links. I like your post. I have turned a long time personal site into a sort of webzine/blog and noticed the random 100 guest occurances. I had no idea if this was a glitch or what — it makes sense, the certain time of day. This post is useful — I found it while searching on google for tips on gaining visitors/community members. I’m still attempting to build a sort of community for unique women. I found this article useful and interesting. As a photo blogger I often leave comments on other peoples photo blogs and in return find that they will drop by and leave a comment on mine. Commenting on other blogs is a great way of attracting visitors to your site as well as creating some interesting conversation. I found you and SMUG through some twisted “7 degrees of Twitter” this morning and I’m glad I did. I look forward to catching up on Social Media through your informative yet easy to read site. Great job! I’ve already recruited a few other smuggles as well! Just testing this; why no recent comments, all from 2008. Just testing this; why no recent comments, all from 2008 or 2009. How can I delete a comment? My link is to my blog article on social media…..
Lee, I have been working through your course on lesson at a time. What I like best is that you explain things in a simple manner and don’t make them more complicated than they need to be. My blog is a newspaper about our HIE efforts in the Rio Grande Valley of Texas. Thanks, Debi…really appreciate your comment. Keep at it!